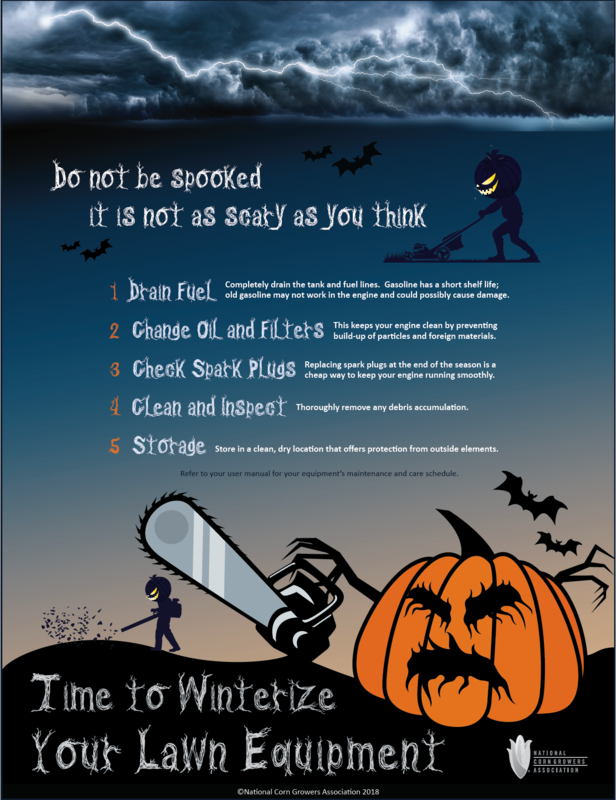 Time to Winterize Your Lawn Equipment! LINCOLN, Neb. – Earlier this afternoon, President Trump announced his administration’s decision to move forward with year-round sales of ethanol blends up to 15 percent (E15). Nebraska Corn is thankful for the president’s support in correcting outdated regulations, and allowing for cleaner-burning, locally produced options for consumers. Currently, due to outdated regulations, E15 can be sold between September 16 through April 30 for vehicles 2001 and newer. Trump’s announcement would simplify this regulation and allow for year-round usage for all vehicles 2001 and newer, which comprise nearly 90 percent of the vehicles on the road today. E15 typically saves motorists three to 10 cents per gallon at the pump and is a natural octane booster. Nebraska Corn will be working with the President Trump’s administration, the National Corn Growers Association, the Environmental Protection Agency and others to ensure today’s announcement comes to fruition by summer 2019. The Nebraska Corn Growers Association (NeCGA) is a grassroots commodity organization that works to enhance the profitability of corn producers. NeCGA has more than 2,500 dues-paying members in Nebraska. NeCGA is affiliated with the National Corn Growers Association, which has more than 40,000 dues-paying members nationwide. LINCOLN, Neb. – The Nebraska Corn Board applauds the work of President Trump’s administration in reaching a deal that will enhance the North American Free Trade Agreement (NAFTA). Mexico and Canada have been major customers of U.S. agricultural products in the past, and maintaining this market access was crucial for Nebraska Corn in NAFTA renegotiations. The agreement, which is being referred to as the United States-Mexico-Canada Agreement (USMCA), is to be published today in order for the governments from the U.S., Mexico and Canada to review and ratify by the end of November. In the U.S., the agreement must go through a 60-day review process before President Trump can sign the agreement.